Historically bitter relations between Syria and Israel have been bypassed by the civil conflict as a wave of injured Syrians get urgent medical help from Israelis. 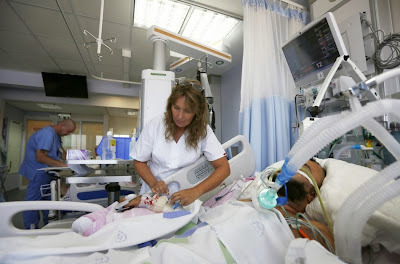 The two countries remain technically at war (Israel is frequently demonised as “Zionist Imperialism” by the Ba’ath Party rejectionists of the Assad regime) but that has not stopped more than 500 victims of the bloody civil conflict in Syria seeking life-saving treatment at three field hospitals especially constructed on the Golan Heights – occupied by Israel after Syria’s defeat in the 1967 Six Day War. One Syrian refugee gave birth to a baby boy in the field hospital, helped by an Israeli medical team. Syrians are fleeing into the arms of their government’s sworn enemy because medical facilities at home have been destroyed by the bloody civil war. October saw an all-time high of 120 patients treated at the field hospitals. Among the wave of injured people are likely to be fighters from both sides. The number is unknown because the Israeli Defence Force (IDF) does not ask a patient’s identity. Despite the antagonism of Arabic neighbours, public opinion in Israel is behind the field hospitals, said one political expert in Jerusalem. The director of Bicom’s Israel department, Richard Pater, told IBTimes UK: “Israel’s been at war with Syria for four decades but following the start of this crisis Israel felt duty-bound to help these people. The risk of a patient waking up and being alarmed about being in enemy territory is real for doctors and nurses in the field hospitals. Steps were taken to soften the shock for one man who came round after he was taken into the hospital unconscious. Staff had a fellow Syrian at his bedside in a bid to ease the alarm. The extremely sensitive nature of relations between Israel and Syria means that the authorities are circumspect about details of the operation and how patients are returned to Syria. Pater said: “We don’t know how the transportation is done. They [the IDF] want to protect them because they would face a very dangerous situation if the regime knew about it. There is no coordination between the Israelis and what passes for the government in Syria. Syrians who risk crossing the border into Israel undergo an assessment of their injuries. The most seriously hurt are taken to permanent hospitals, the rest go to one of the field hospitals or are turned away. Around 70% of patients present with torso or extremity wounds, while 15% suffering from head injuries. There are hopes that this example of soft power may pay a dividend in one of the world’s most troubled hot spots. Well, Jews used to be able to live and eat hummus in Damascus. I wonder what happened to them all? Sorry for the cynicism, but when given the multiple examples of pure Jew-hatred in the mainstream Arabic media every day, I don’t think that Israelis are helping Syrians with any hope that it will change any minds. They do it because it is the right thing to do. Why do BDSers hate Palestinians? imj on How do you treat a lying, biased reporter? Bubbe on Saudi princes know how to par-ty! 24-6 News © 2019. All Rights Reserved.